There are lots of rolling luggage options available, but not all of them are of the same great quality. Some bags aren't worth the money, so it's important you spend some time considering the different brands and models to make sure you buy a great quality bag that matches your needs. Having checked thousands of rolling luggage reviews, we can say that the Osprey Shuttle is the best choice for most people. The Osprey Shuttle got a rating of 4.35 out of 5, while the average rating in the list below is just 3.63. This is the best reviewed rolling luggage. We have checked 16,114 rolling luggage reviews, so we can show you the weighted average rating of all the bags. If the Osprey Shuttle isn't your style, you might also consider the Osprey Ozone. The Ozone is a close runner-up with a rating of 4.22 out of 5. The second-best reviewed rolling luggage. Finally, you might consider the Stephen Joseph Classic. The Classic is the third-best rated rolling luggage with a rating of 4.16 - and it's most often cheaper than both the Shuttle and the Ozone. The third-best reviewed rolling luggage. Below is the list of all top 10 best rolling luggage. Great if none of the three bags above are your style. PS: We have checked 16,114 reviews to make this top 10 list! It doesn’t matter how you choose to travel, the one thing that you will need on hand is at least one bag to carry all of your things. Since you don’t possess superhuman strength, you require rolling luggage to make getting all of your baggage from one point to another with minimal amount of effort. While this should be a drill that people are familiar with, many tend to come up short when having to choose travel bags. Since we understand the wide variety of options available and the difficulty in choosing between them, we have decided to lend a helping hand. In this article you will find a comprehensive guide of rolling luggage and useful tips on how to choose the best option for you. How many times have you bought a piece of rolling luggage only to find that it is completely wrong for your type of travel? Not only is this an expensive mistake, it can be a frustrating one to endure as well. Too often, people simply don’t put enough of thought, time, or effort when choosing their luggage. In case you weren’t familiar with all of the elements that you need to consider when making such a purchase, we have decided to include them in this article. Here, you will discover all that you need to know about wheeled luggage as well as how to make a smart choice. Wheeled Backpacks: These are essentially backpacks that have a set of wheels and an adjusted handle attached to it. The main benefit of this type of bag is that it can be used as carryon luggage and will not take up much space. You will usually find these backpacks with a capacity between 35 and 50 liters. This is enough space for clothes and a laptop for a weekend trip, perhaps. Suitcases: These are arguably the most familiar pieces of rolling luggage. While they do come in various shapes and sizes, they are typically longer than 21 inches and have to be sent as checked luggage, if you are traveling by plane. These can further be categorized as either soft or hard cases. Suitcases are often able to accommodate a capacity upwards of 70 liters. Rolling Laptop Bags: These resemble small suitcases although their main purpose is to carry your laptop and tablet and other documents as well. The interior of this bag has many compartments and pockets to make it easier to organize. Travel Duffel Bags: These are basically duffel bags with wheels and be considered the less elegant version of the suitcase. What they lack in appearance though they make up for in versatility and lightness. They are often able to hold volumes between 30 and 50 liters. Hard Shell or Soft Shell – Which is Right for You? 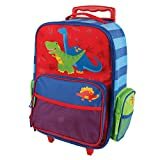 If you are going on a slightly longer trip or just want to be able to carry more stuff, then you will require a suitcase. This means that you will need to decide between a hard shell and a soft shell suitcase. A hard exterior is often made of a more durable material such as plastic while soft shell consists of fabric. Soft shells are still one of the more popular options. This is largely due to the fact that it is quite flexible. This allows you to make more things into it. These suitcases often have expanding features which allow you to carry larger items as well. Because of its flexibility, the suitcases are also easier to store in tighter areas. If you get a good quality soft shell, then you can be guaranteed durability. These cases are made from thick and tough fabric that will not easily tear or give away. The lighter options, however, are usually made of thinner fabric and can be ripped more easily. The main benefit with hard shell suitcases is that they are often more durable, depending on the material that they are constructed from. They are great at protecting more fragile items and are often harder to break into as well. In certain instances, the hard shell cases can be a similar weight or even lighter than those made from soft shells. While being unyielding may be a strength for this suitcase, it can also be a weakness. This is because it can’t as easily fit into tighter spots. Also, if the case is not made from a durable material, there is a chance that it may crack or break. Due to the limitations in size, you can’t always take as much as you would like in these suitcases. What Are Rolling Suitcases Made Of? Usually, a soft shell case will be made up of either nylon or polyester. The more affordable or budget options are typically made from polyester. These cases are relatively light and strong but are also susceptible to wear and tear as well as cuts. Nylon is used in more expensive luggage pieces. Since the material is slightly thicker and tougher, the cases tend to weigh a little bit more. However, the payoff is that the luggage is actually quite hardy. It is abrasion resistant and is great for long-term use. As the hard shell cases have been gaining popularity, there is actually quite a lot of variation in the materials that they are made from. Some of the cheaper versions could be made from PVC. It can be tempting to choose cases made from this material as it is affordable and lightweight to boot. Where these cases fall short, however, is when it comes to strength – they can crack and break quite easily. Next up is ABS plastic, which is slightly more durable than ABS. Despite the low price, it is best to not opt for a suitcase that it is only made from ABS plastic. Instead, look for those with a combination of other materials as ABS, by itself, isn’t all that strong. If you are looking for a case that it is as light as possible, it is a good idea to consider a shell made from polypropylene. It is also relatively flexible so it does provide your belongings with a certain level of protection, particularly against other suitcases. Last but not least, there is polycarbonate. While it is quite light, the main draw of suitcases made from this material is its toughness. It is actually impact resistant and you can be virtually guaranteed that your suitcase will not break or crack. If durability is what you are after, this is the material for you. Now, when choosing rolling luggage, you probably don’t glance down at the wheels. Well, you are actually making a grave mistake by ignoring the luggage wheels on a suitcase or bag. After all, these are responsible for how easy it is to transport your luggage from one point to another. You are probably most familiar with suitcases with two wheels. Here, there are two wheels on either side of the case and it is only this side of the luggage that is touching the ground. This means that, to a certain extent, you have to bear the weight of your baggage. The main benefit of this design is that you can easily maneuver it over uneven or rough floors. This means that it is more suitable for all kinds of environments. Also, on average, you will find that these wheels are more durable since they are built into the design of the suitcase. Spinners are suitcases that have four wheels. Since all the wheels take all of the weight of the suitcase, these tend to be easier to push and pull, particularly for longer distances. These are also great options for stairs and tighter spaces since it can be carried sideways due to the wheels being able to move in a 360° formation. The downside of these wheels is that they don’t work well on any surfaces that aren’t smooth and even so they are best for only wheeling around in airports and other interiors. The wheels also tend to be slightly less durable as well. So, what wheels should you look for? It is best to go with the larger wheels. These are able to move across most spaces with ease. They are also unlikely to get caught in small ridges or dips and are easier to move around with. You should stay away from hard wheels as they can break when rolled over rocks as they have virtually no flexibility. Softer wheels will probably last you a longer time. Even if you get quality wheels, you should check that they can be replaced if something does happen to them. The final part is to decide which piece of luggage that you should settle for. Now, there isn’t a hard and fast answer to this question. You will have to think about your particular situation – destination, length of trip, weight restrictions, personal requirements, budget, etc. before picking one. Still, here is a loose guide to what you may want to opt for. 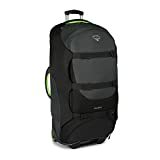 If you are going on a leisure trip or want to go exploring but won’t be staying long, then you should look for a wheeled backpack or a travel duffel bag. These are lightweight, can be used as carry-on luggage and have lots of compartments. Plus, in some instances, you can actually remove the handle and wheels structure and use the bag as a day pack while you are moving around. You should note that this type of luggage may look out of place in hotels. Businesspeople will find wheeled laptop bags to be quite useful. There is often enough of space for all of the items that you will need and sometimes, enough of space for a change of clothing as well. You will typically need to accompany this with other suitcases though as there is not much room for anything else. Suitcases will pretty much fit the bill for any other type of travel. Just remember, the bigger the case that you choose, the heavier it will be when empty. This is an important point due to airline luggage fees. So now you know pretty much all of the information that will be relevant to you choosing rolling luggage for yourself. Classic rolling luggage and models that haven't yet got enough reviews to be ranked. List ID 42. Images from Amazon Product Advertising API and shop datafeeds.